In 4 starts in July, Anthony Fernandez is 1-2 with a 3.04 ERA (8ER/23.2) and opponents are hitting just .181 against him. 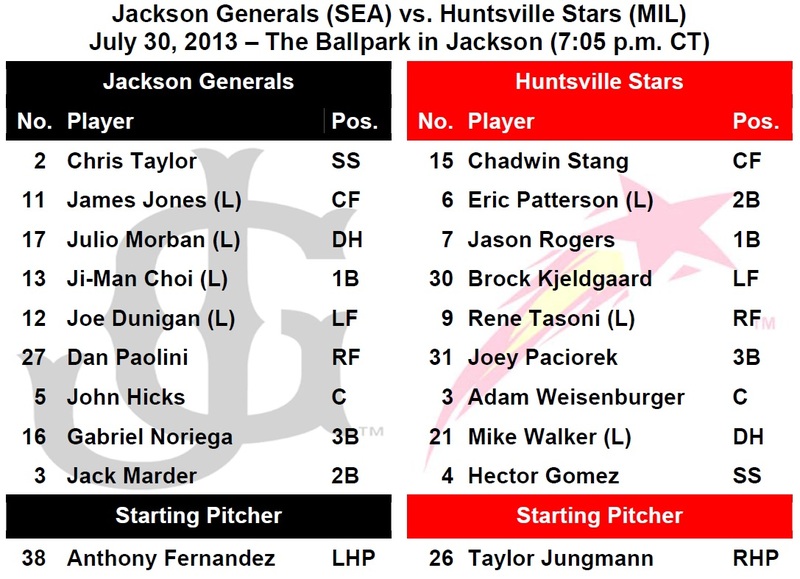 TODAY’S GAME: the Generals continue a 5-game home series tonight with game #3 of the series against the Huntsville Stars (0-2)…the Generals are 4-6 against the Stars this season and 1-4 at The Ballpark in Jackson against the Brewers AA affiliate…the Generals have won 4 of 5 series’ coming in and are 5-5 since the All-Star break… 22-year-old LHP Anthony Fernandez makes his 16th start of the year, 92nd of his career and 29th for the Generals tonight…In 4 starts in July, Fernandez is 1-2 with a 3.04 ERA (8ER/23.2) and opponents are hitting just .181 against him. In 4 career starts vs. HVL Fernandez is 2-2 with a 5.74 ERA. 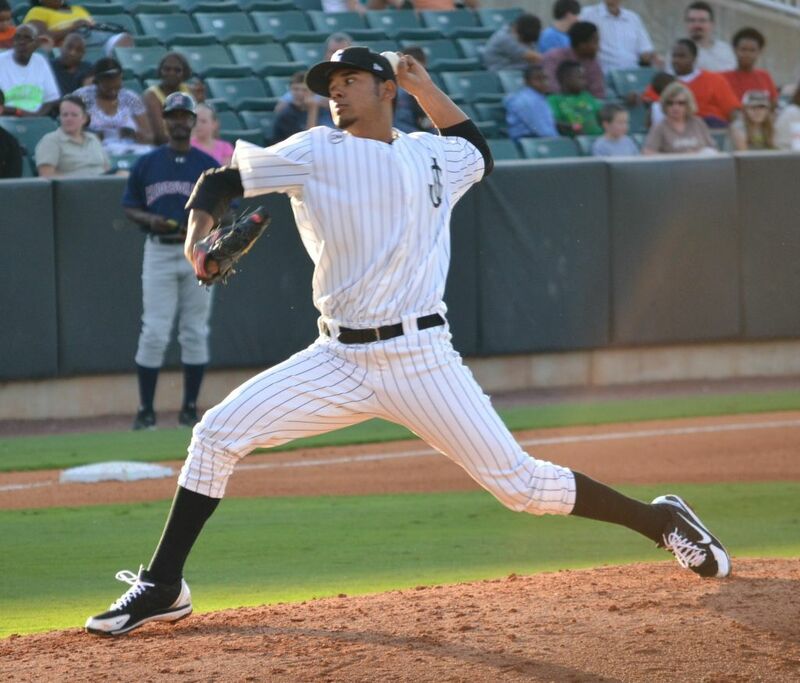 GENERALS RECAP: 1B Ji-Man Choi hit a 3-run triple with 2 outs in the bottom of the 3rd inning to take a 3-2 lead, but the Generals allowed 3 runs in the top of the 6th inning as Jackson lost to Huntsville 5-3 on Monday night. Choi (1×3, 3B, 3 RBI), SS Chris Taylor (1×4, 2B), DH Joe Dunigan (1×3, BB), C Michael Dowd (1×4, R) and 2B Jack Marder (1×3, R) each recorded 1 of the Generals 5 hits. Starter Roenis Elias (5.1,2,4,2,3,8,HR) allowed 4 runs (2 ER) on 2 hits and struck out 8 in 5.1 innings and suffered the loss. RH Stephen Shackleford (0.1,1,1,0,2,0) allowed 2 inherited runners to score and was charged with an additional run in the 6th inning. LH Nick Hill (1.1,1,0,0,1,0) and RH Carson Smith (2.0,2,0,0,0,2) combined to hold the Stars scoreless over the final 3.1 innings in relief. • INF Ji-Man Choi is batting .343 (12×35) with 3 runs scored, 5 extra-base hits (2-2B, 2-3B, HR), 7 RBI and 5 walks in last 9 games. • INF Jack Marder has hit safely in each of his last 4 games, batting .429 (6×16) with 4 runs scored, 1 triple, 1 home run and 6 RBI. NEWS & NOTES: 37 of first 100 games have been 1-run games (15-22) which is the 7th in all of minors…53 of 100 games have been decided by 2-or-fewer runs (19-34) and 12 have been extra-inning games (4-8)…In games decided by 3+ runs the Generals are 25-21. • ALUMNI REPORT: In 37 games with AA Midland (OAK) since being traded by the Mariners, Vinnie Catricala is batting .217 with 1 home run and 18 RBIs. In 44 games with AA Lakeland (DET) since being traded Francisco Martinez is batting .303 with 3 home runs and 16 RBIs. He has 6 stolen bases. • TRIPLES ADDING UP: OF James Jones recorded his league-leading 10th triple last Wednesday in Chattanooga. He is one triple away from tying the franchise record. Jones is tied with Richard Lewis (10, ‘04) and Chris Walker (10, ‘06). Dwaine Bacon (11, ‘04) and Bo Porter (11. ‘98) are leaders. As a team the Generals have 31 triples which is 2nd-most in the Southern League. • WE GOTCHA! !…Jackson catchers lead the SL catching 52.4% of base stealers (55 CS, 105 Att). The next closest is Birmingham which is throwing out 34.2% of base runners.